Stow, OH, USA (August 22, 2011) — SPIROL International Corporation is proud to announce that their Disc Spring product offering has been expanded. Disc Springs are conically-shaped, washer-type components designed to be axially loaded. They can be used individually or assembled into stacks to achieve the desired deflection characteristic required for the application. 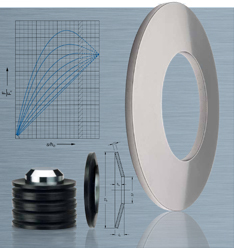 SPIROL Disc Springs' performance characteristics are predictable and the minimum life cycle can be calculated. They also provide high levels of load / force within a very small space unlike other springs which require a significantly larger footprint to achieve the same load. Due to their predictability, high reliability and unparalleled fatigue life, Disc Springs are preferred over all other types of springs in critical applications such as safety valves, clutch and brake mechanisms for elevators and heavy equipment, and supports for industrial pipe systems. The two major updates to the newly expanded product line are larger sizes per DIN 2093 Group 2 (now available up to 200mm in diameter), as well as a full range of stainless steel Discs. Details are provided in the updated Disc Springs design guide. If you have an application requiring a high performance spring, please get SPIROL involved as early as possible in the design stage so that they can help design-in the most appropriate Disc Spring. SPIROL's Application Engineering team will also determine the optimal method of stacking the Discs to achieve the desired force-deflection characteristic if multiple Disc Springs are required in the assembly.